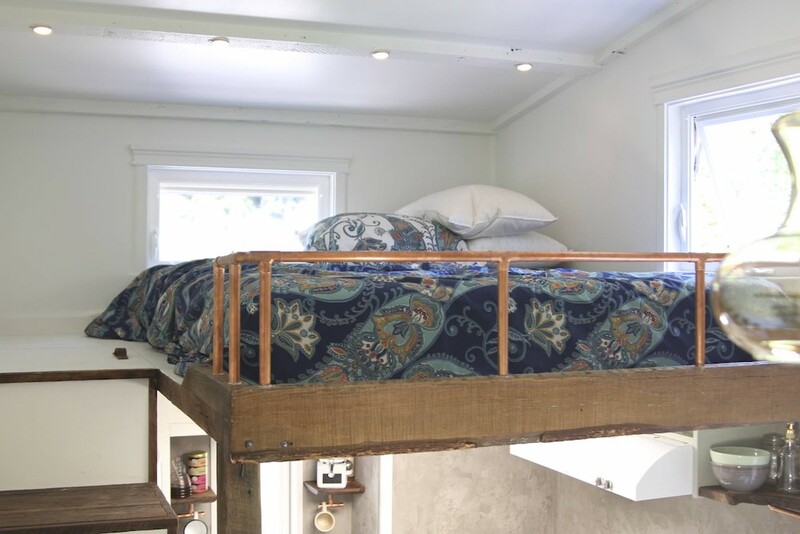 A 250 (loft included) square feet tiny home built by Handcrafted Movement. More info. here. Beautiful home! Love all the details. I was wondering where the couch is from? Thanks! Wow I really like the layout of this tiny house it is very functional with all the daily things needed especially the coffee area. This is the most beautiful home — tiny or otherwise — I have seen in a long time. That coffee nook in the kitchen… Name your price! The white surfaces contrast so nicely with the dark wood. 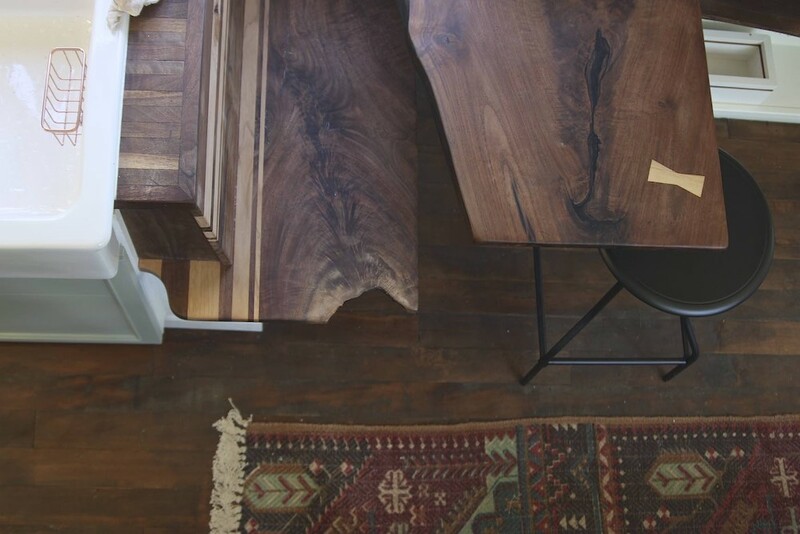 I was thinking the same thing.. right down to that amazing live edge bench seating. Beautiful! I’d love to have this with 2 lofts. From the pics, the craftsman work it spectacular. I also love the contrast of dark wood, white and all of the other textures as well. Wow!! as the reading above said, the tiny kitchen nook – so cool. I also LOVE the fridge fitted into the staircase – never seen that before, fantastic idea. Love this tiny house. Any price yet? I love this house. 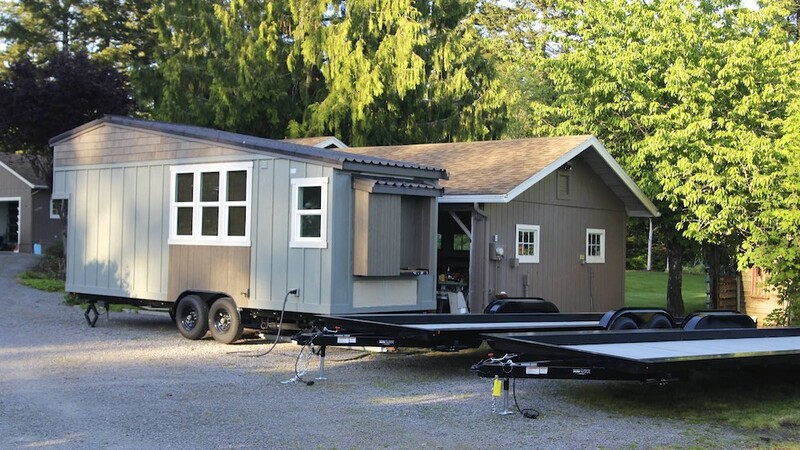 Probably one of the most efficiently made, aesthetically pleasing tiny houses I’ve seen. One question though… if you live in a tiny house and do not have much room to store all of the construction things, such as tall ladders, what do you do when you have to maintain your house years down the road? Like those tiny lights up in the ceiling, obviously you’ll need a ladder to replace the lights. 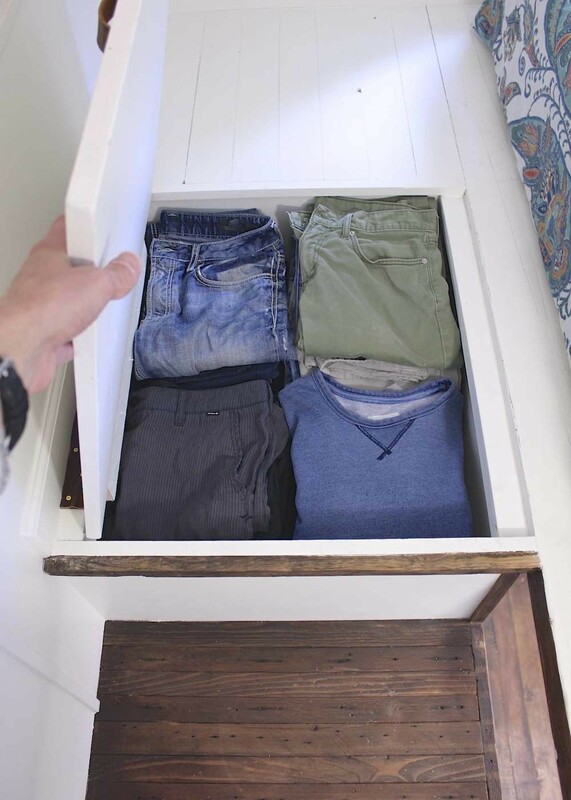 Do most Tiny House owners have separate storage unit to keep large bulky household items?? Most of the lights in tiny Homes are LEDs. Well done! I love the careful detail and copper accents. Beautiful work. Thanks for sharing! …. 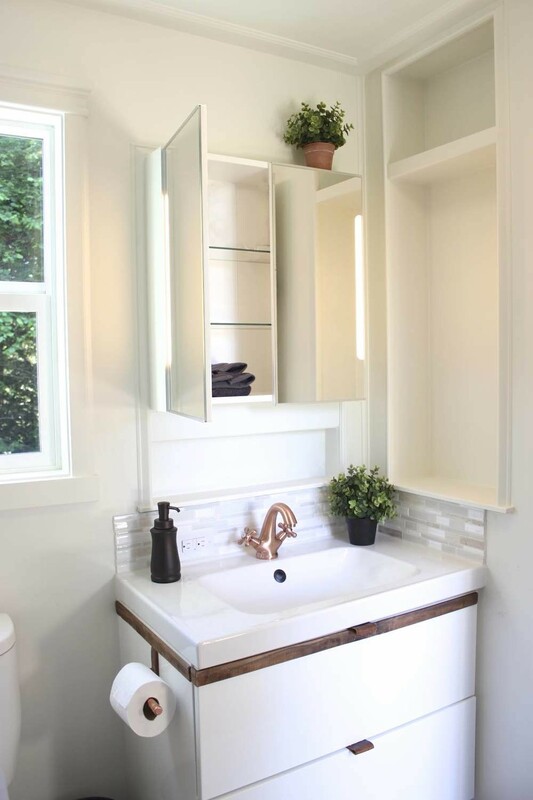 meant to remark on this super kitchen — that sink is a winner: life requires at least one big sink in any real house whether to wash large pans, bathe a baby or rinse out a big bulky sweater. The LG fridge if I’m not mistaking the model, is 10.5 cubic ft with excellent organization, and operates as silent as the grave. Let me tell you, I replaced an apartment-sized fridge for this one, and it’s a work of genius, by far the best choice of any other on the market as far as design, utility and economics. Meantime fitting a gas oven/stove/hood is key to enjoyment of any permanent or semi-permanent home. So many tiny houses show a couple of burners or a hotplate, or toaster ovens, or some kind of lame electrical device for cooking in the name of “small”, rendering small an immediate sacrifice rather than a joy. 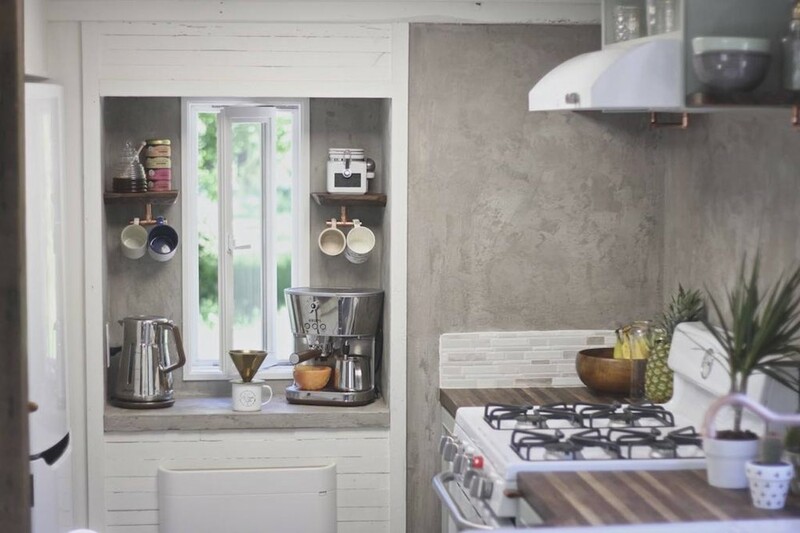 To cut short, this kitchen – the entire home – is exemplary among the tiny houses, of succinct considered utility and design. Agree wholeheartedly with your opinion. It takes considerable skill to make a house stylish AND practical. This looks like a tiny home one could actually live in! This is beautiful! I love how the stairs are lower profile and utilized in the kitchen. Great job! This is Fine Design. One can see the thoughtfulness of planning long before construction began, with a very intuitive choice of textures and materials. Well done. I can’t add anything to the comments already posted…except to say that this is one of the best tiny homes I have seen so far. I wish it were mine. I REALLY like this tiny house. Excellent layout for a home for me! Guess I will just dream though, can not afford it at this time but the look and the layout is just my style and I would be a happy person living in it! C’est du très beau travail ! Great interior design, bravo ! As to all of the comments up to this point, “AMEN! As a dedicated coffee addict, I really love the dedicated coffee preparation insert in the wall. Perfection for someone like me. The kitchen is great as is the rest of the house. What is the price? Oh, I’ll check the website for that. I want one but I don’t have any funds at this time. One of my favorites so far. So well designed and thought out. Love the colors, textures, and just about everything! Beautiful job. This is beautiful. What is the cost?I have seen many but this is breathtaking in every detail.Copper touches stole my heart. What can I say that hasn’t already been said? Perfection, indeed; the very best tiny house I’ve seen in a long time, absolutely; beautiful, functional, comfortable looking, light and airy, and one of the most sensible loft/stairs combinations ever seen. The coffee station is genius; while I’m not a coffee snob, nor even a heavy coffee drinker, I do very much enjoy a pot of Green Mountain brand Vermont Country blend (no, I don’t work for them, I just like that coffee a lot). The coffee station would be so great to have for a top-notch, state of the art coffeemaker…..(DEEP SIGH of bliss). Oh, and a real, flushing toilet!!! No need for sawdust and cat litter!!!! Kudos to the designer and builder; if I had the means, I’d be ordering this house for myself. By far the best I’ve seen. Who is the builder/designer and prices? Great design. I’m interested in price and location. I would be interested in bedroom on 1st floor. Love the layout of this tiny. I personally would’ve made the bathroom a bit bigger and made a better area for a tv, but other than that, the detail is amazing. 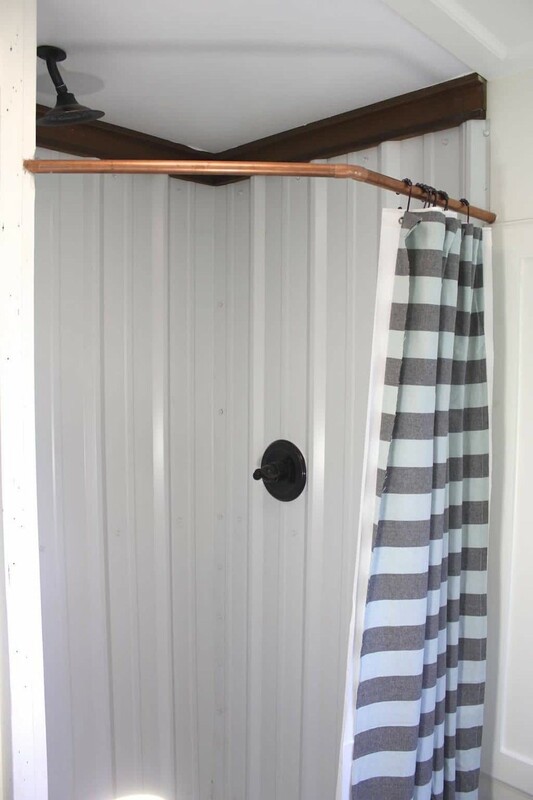 I have always wondered, where do you store tall items…like ironing boards, mops, brooms, and even hanging long dresses? 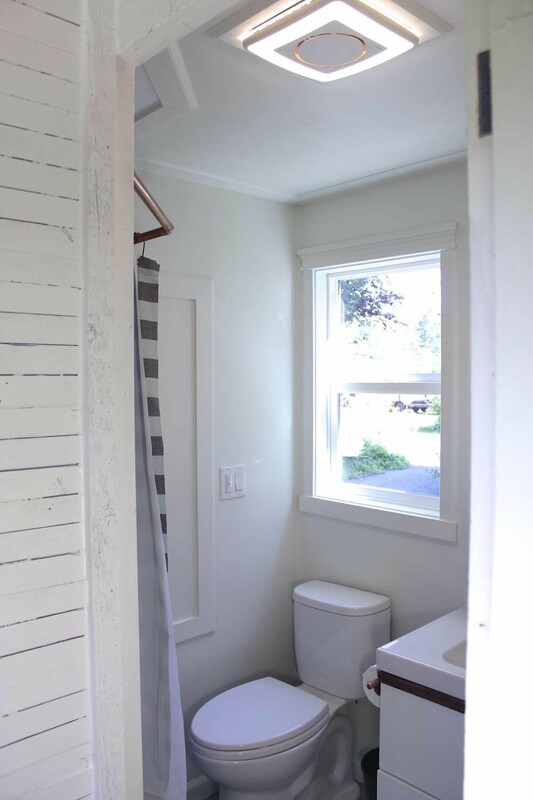 In all my 2 years of browsing tiny homes, this one is an absolute winner in all respects. So breathtakingly beautiful and elegant, functional, and perfect. The choice of wood, the appliances, and all the built-in details are remarkable. I would love to live here.